"Chapel Americana" Masonry, vintage coffee mugs, Christmas lights, muslin, wood and oil paint on fourteen panels. 13 feet by 17 feet by 14 feet. (this view is looking north with a montaged view of the north, west, and east walls) 2006-10. "Chapel Americana" was a nondenominational meditative space that was located in my former studio in the old Artkraft Strauss billboard factory on 57th Street in Manhattan. 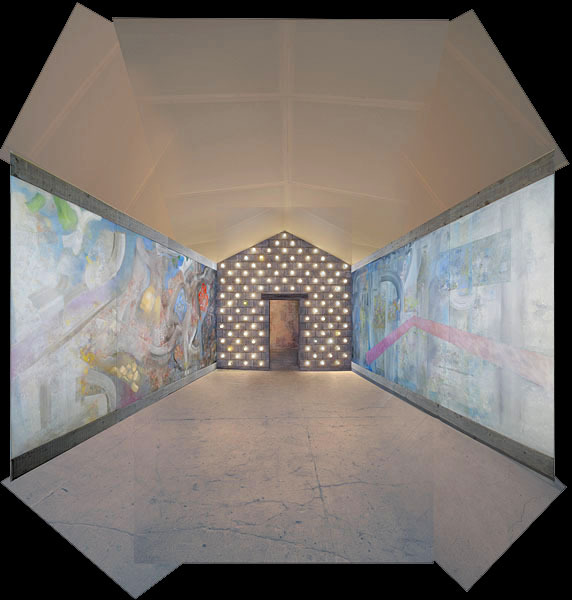 The north wall was masonry with built-in lighting fixtures, and was the Chapel's light source; the south, west, and east walls were composed of a cycle of abstract paintings whose value structure interacts mysteriously with the light of the illuminated masonry wall. Below is a video produced by Jennifer Hsu and Carolina Miranda of WNYC. Also, see additional still images below.